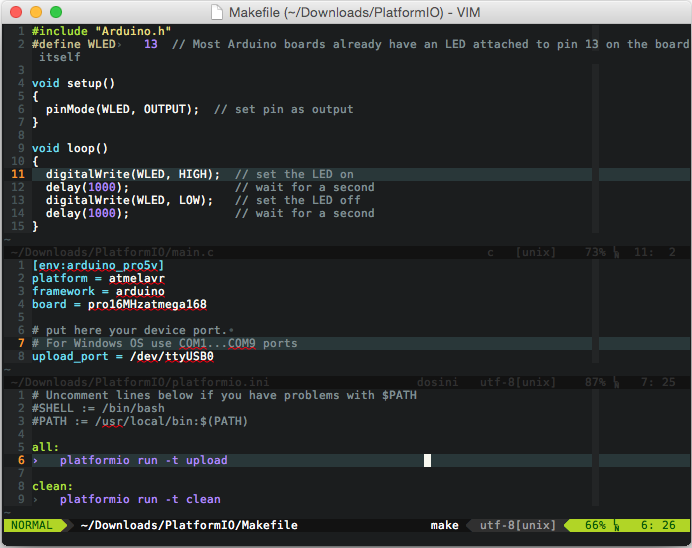 VIM is an open-source, powerful and configurable text editor. Vim is designed for use both from a command-line interface and as a standalone application in a graphical user interface. Please visit neomake-platformio for the further installation steps and documentation. Clean - Clean compiled objects. Update platforms and libraries - Update installed platforms and libraries via platformio update. Now, in VIM cd /path/to/this/project and press Ctrl+B or Cmd+B (Mac). PlatformIO should compile your source code from the src directory, make firmware and upload it. See a full list with Articles about us.